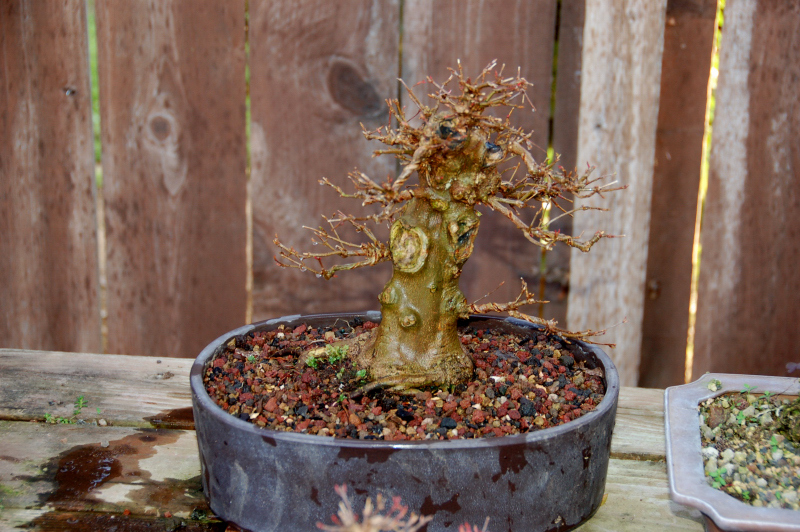 This Trident maple has been the subject of many articles here but this time it will get a new pot. Re potting here startes early, like in January. This tree wtill has Christmas ornaments on it from the previous month. 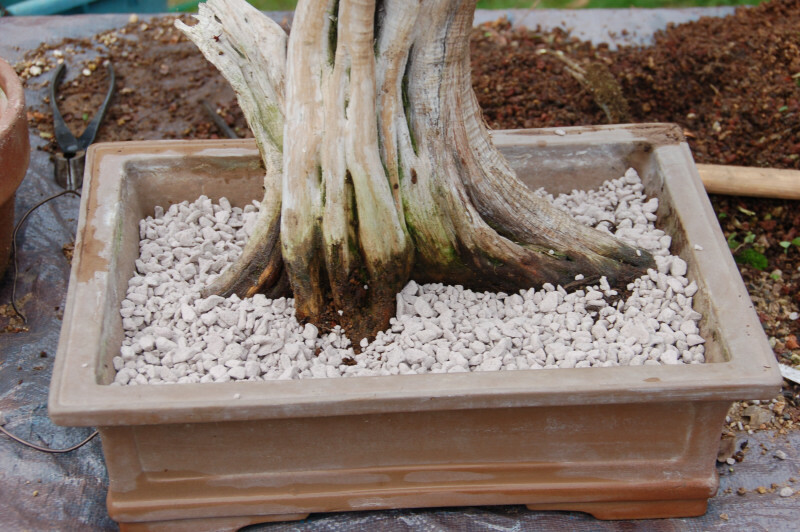 The tree is lifted from the pot and a thick matt of roots are starting to move already. 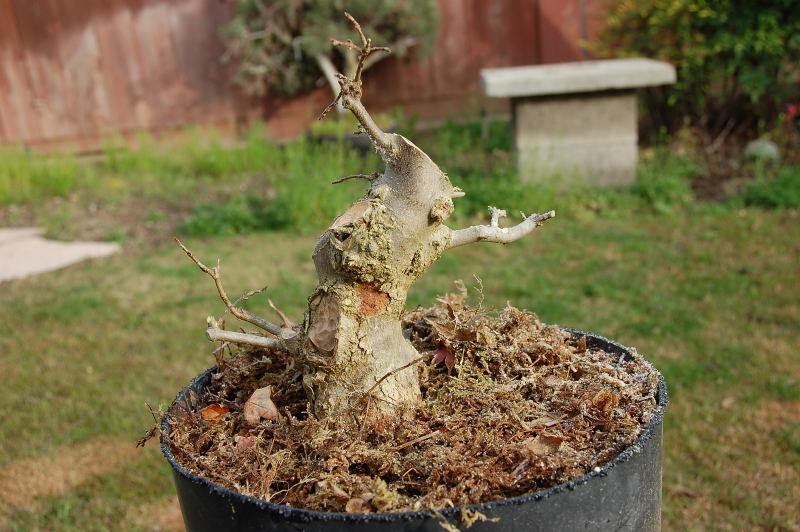 This tree is so vigorous it must be re potted each year as the roots lift the tree from the thin pot. I remove a full two inch ring from the tree and comb out the roots. 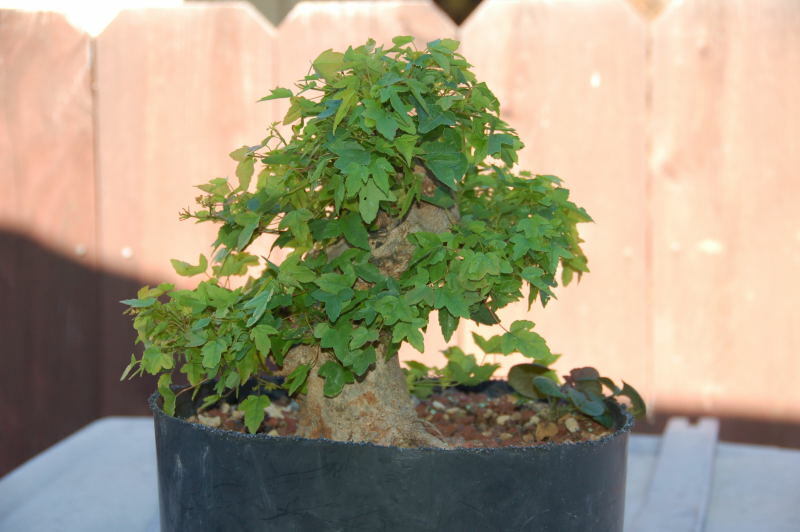 The new pot is from Robert Pressler and Kimura Bonsai in Southern California. It is a sky blue Chinese bag pot. Trying the pot for size. I like it! 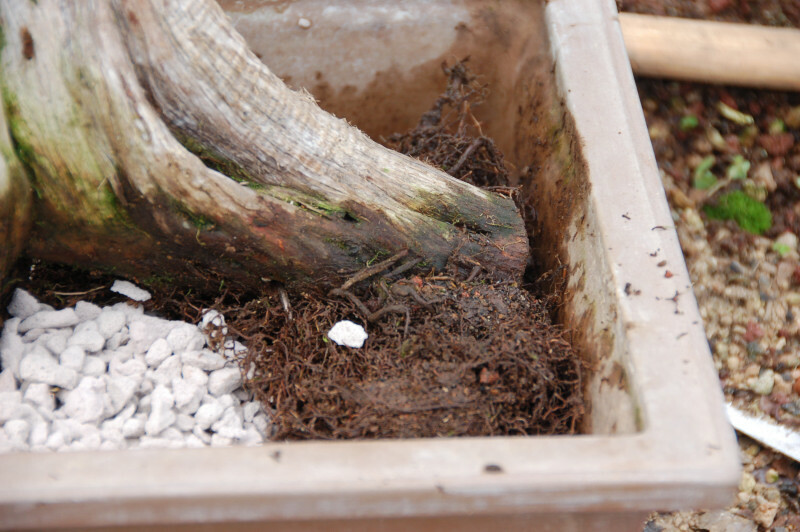 Soil layer with 30 percent coarse fir bark. At the recent Fresno Home and Garden Show March 2017. There is not a lot of information on the net about this process. 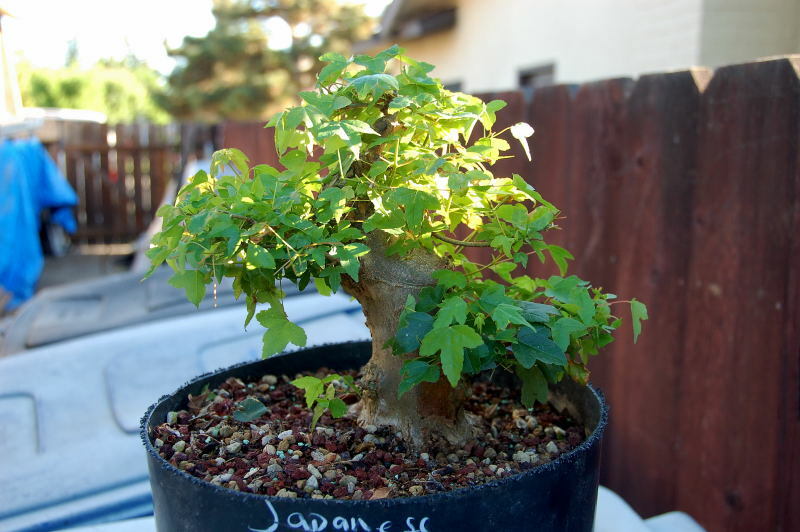 I started treating my maples this way about ten years ago. Walter Pall has spoken about it at his blog, but not much in the way of how to keep up on the process. There are other ways to treat the canopy of a maple tree and these other treatments have to do with where the tree is in development. 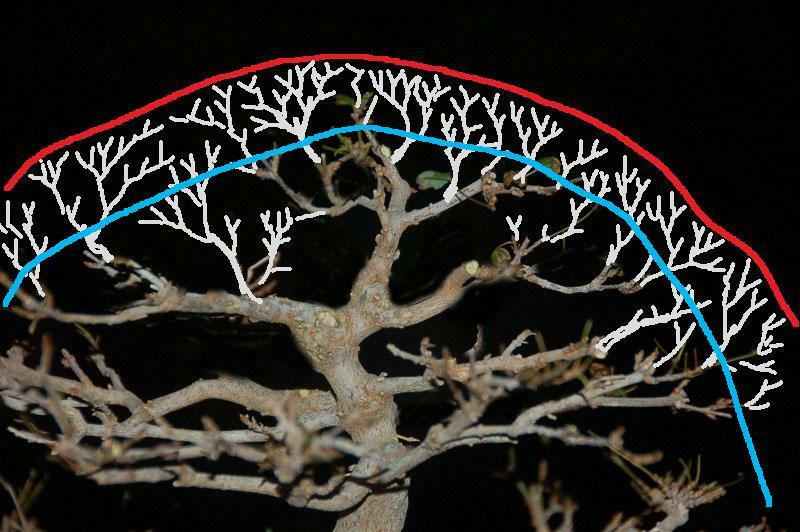 During the trees early life, much like candle management on a pine, early treatment is more coarse and in a branch building mode. 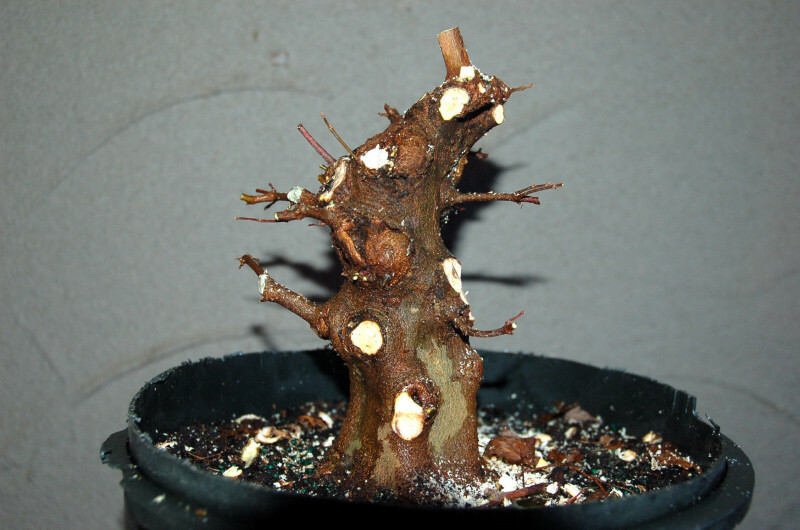 There is no need for select bud pinching on a tree that will have it’s branches cut many times during the growing season. Bud selection in April likewise on a pine is kinda pointless. As trees in training begin pushing new buds, the main branches are chosen. As they harden off, the permanent primary branches are now allowed to elongate to gain thickness. Wire is applied and the tree is left to grow. In mid summer these can be cut back when the tree slows down and then allowed to once again elongate in late summer into fall. 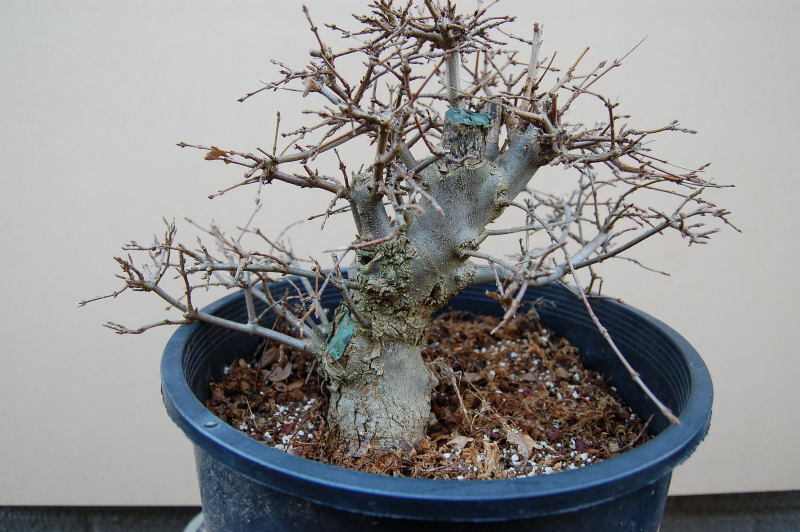 In Fall all the branches are pruned back hard and then new directions can be worked into the primary stubs. After successive years and primaries set, the same can be done to build secondaries. During the building of secondaries the first beginnings of hedging can now be allowed to begin. First I will explain what hedging is to me. It may not be the same for all but for the sake of my blog I will call it hedging and this will be the technique I have developed and use. I feel I get good results and tweak the process as the years go by. The primaries are set to a specific form. It is this form that the tree is hedged to. This form will now be the template for pruning/ hedging for the next several years. The form may grow in volume and become larger, but the shape must remain the same. To change the shape after several years will mean to cut off all the work the years of hedging have provided. 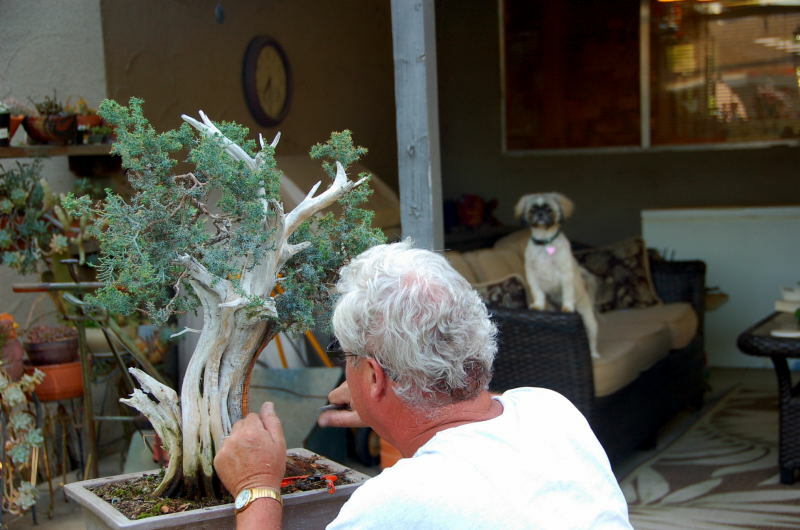 I will provide a few photos of a tree thru the process and up to where it is today. 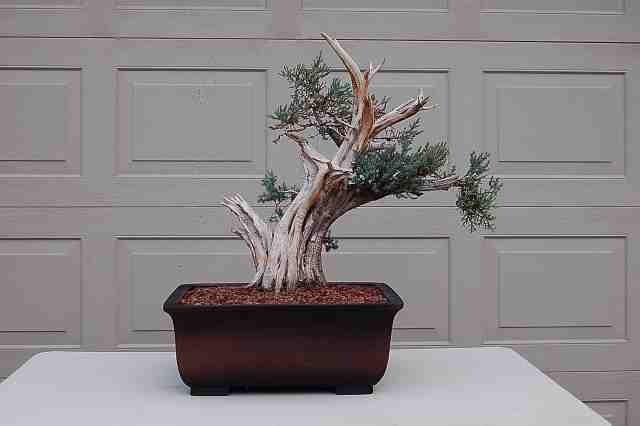 This is the tree as purchased. 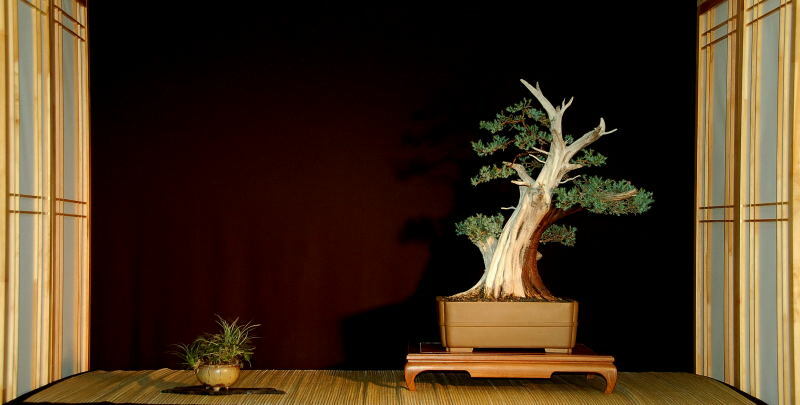 It is bare rooted and all the branches that will not be used are removed from the trunk. 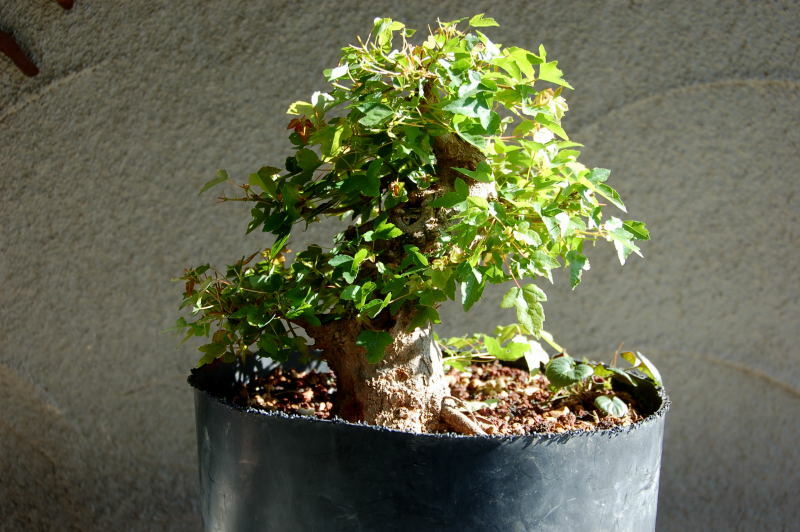 At the end of the first season the tree is kept compact by hedging to a conical shape. 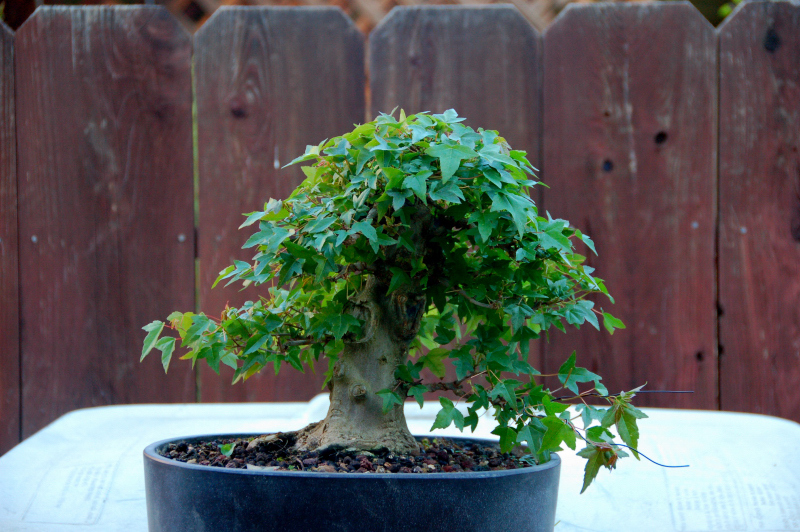 This shape keeps the bottom branch longer and thicker while pruning back the branches at the top smaller and shorter. In fall the primaries are chosen and wired. The front was reestablished with a quarter turn. This Spring, after bud break the tree is allowed to run for a few weeks. 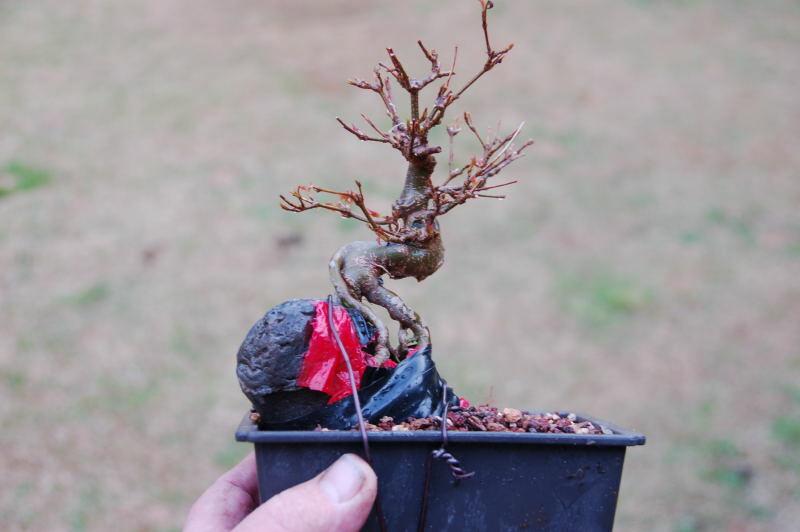 As the shoots begin to harden off, the tree is hedged for shape. The hedging is done with regular pruning shears but the shape is taken back to a preconceived place much like pruning a hedge, hence the term hedging. A couple of days ago the second flush of leaves have hardened off and the hedging process can continue all summer long about every three to four weeks. This does not weaken the tree, on the contrary, many buds will form from the cut back. 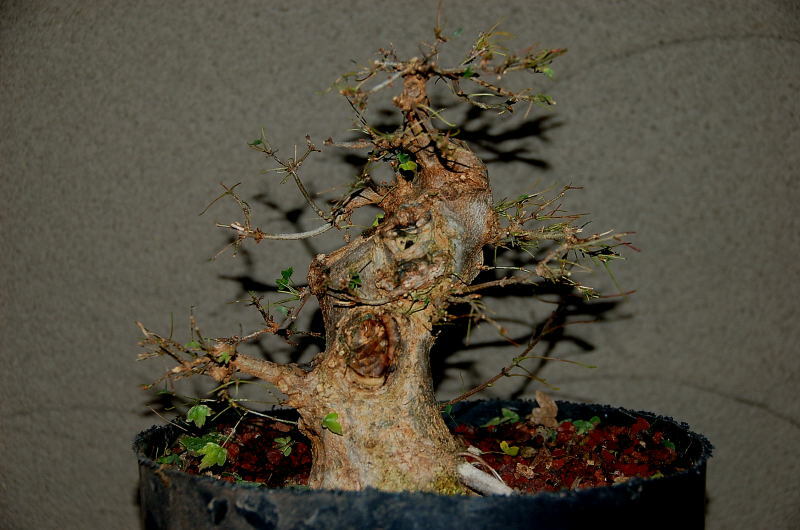 In this shot we can see that the bottom branches have not been trimmed to allow for enlarging the branch and gain some extension. This is another tree that has received the same process. Again the tree as purchased and this one was radically cut back. 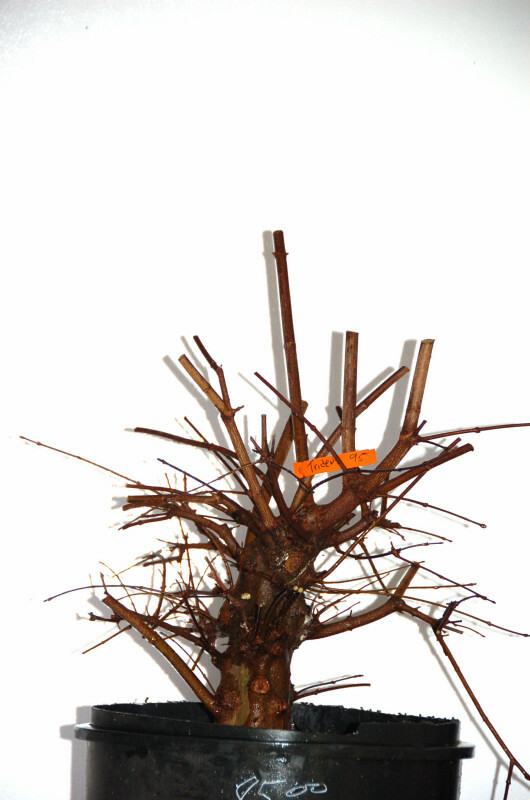 The tree received several approach grafts to improve branching. This is the primary branch selection process and these are allowed to grow and cut back. 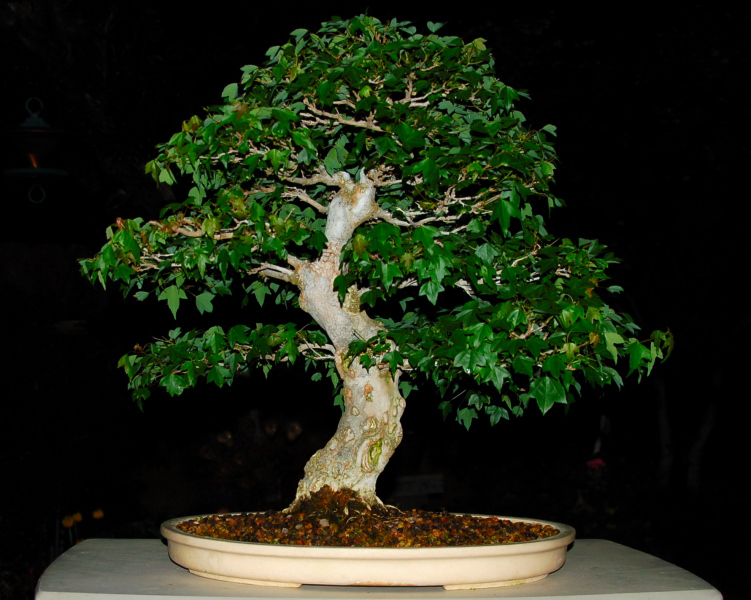 As the tree progresses the canopy is hedged for shape. Again this is achieved by hedging to a conical shape. 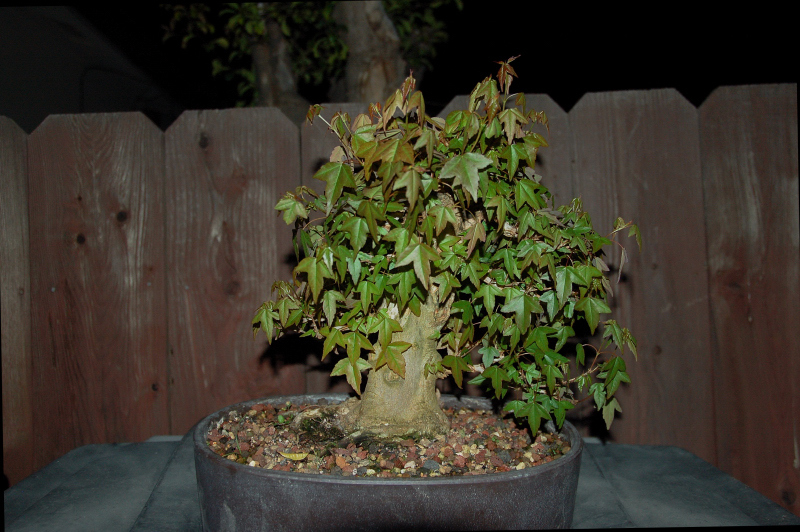 Hedging is done each time after the hardening off of the previous hedging. This keeps a continual flow of new twigs coming while other are budding, some are growing. At this point after the yearly hedging process the branching is now at the secondary point and a more feeling of ramification can start on the frame. Bud break this year. The tree is starting to really push now and a cut back is only weeks away. The most recent hedging is now starting to show how the layers are being defined and the canopy is shaping up to be a slanting trident. Not seen often. So what happens after years of trimming and hedging? Each fall the tree will be pruned after leaf fall. This is the time we can come in and remove heavy growth at branch ends, and thin the structure out if needed. It will be needed. 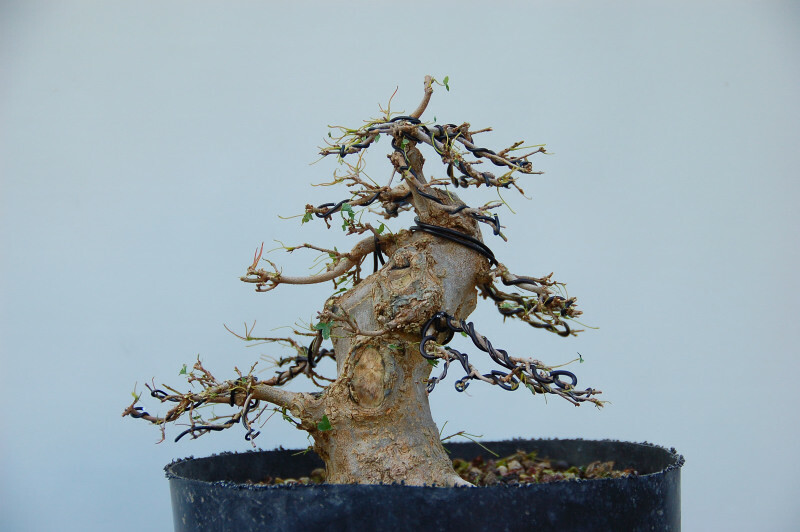 After several years the tree should begin to settle down into a nice shape and the final tertiary ramification can begin. It takes many years to build a fine canopy of fine twigs. This tree has been developed by this method for 14 years. the outline of this canopy only needs periodic light scissor pruning of shoots to maintain the outline. In the Fall the top may look like this. very coarse and heavy growth due to apical dominance. 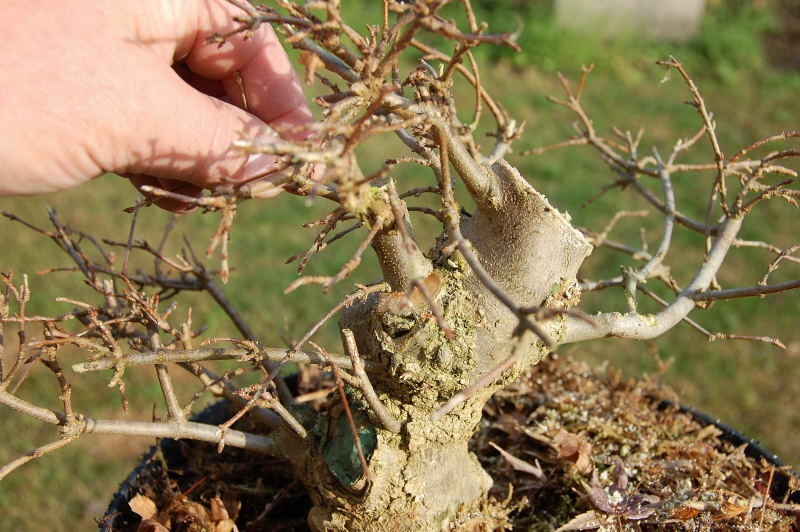 Pruning can lighten this feeling and help establish a framework for the tertiary buds to follow. Last years hedging can bes een in blue. The current years hedging will take place between the blue and red zone. This is where I want the small twigs to ramify. Hopefully at the end of the season I will be rewarded with a small crop of twigs to build on. 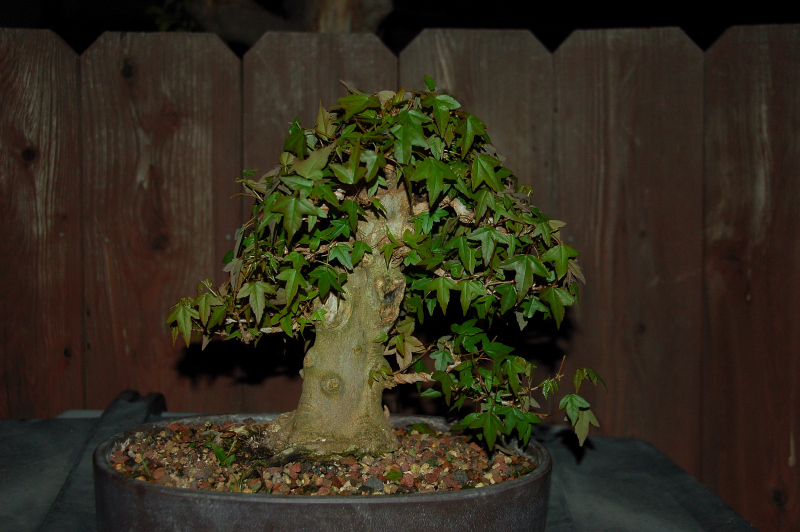 This small maple started as a cutting in 2006. 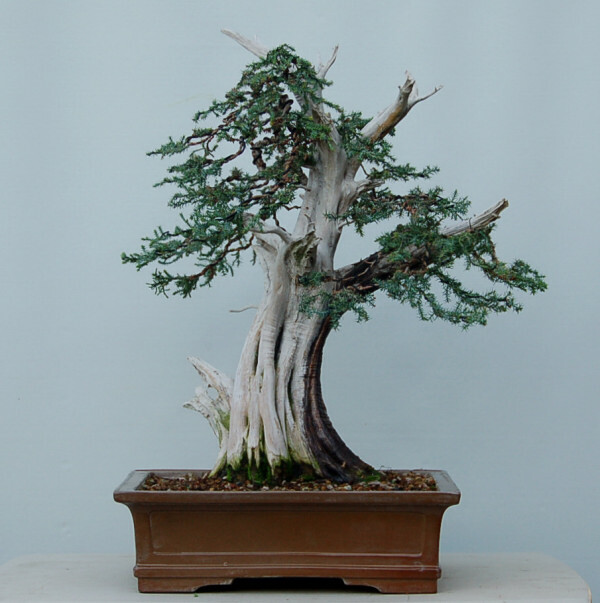 It had an unusual bend in the trunk which I accentuated and decided that I woud train it into a neagari (exposed root) style. I planted it out in a half gallon milk jug to grow the roots long. 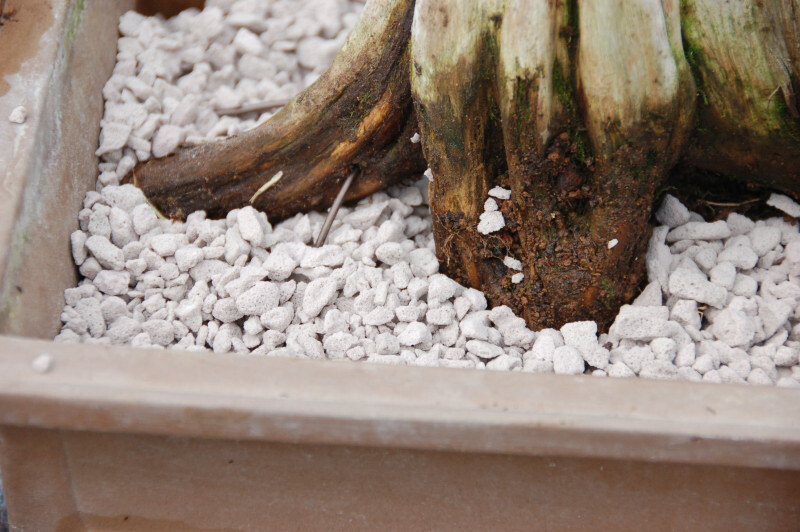 I grew the roots in straight pumice with the top of the jug backfilled with akadama. The roots went straight down in the pumice. sitting in a water saucer. The tree did not grow that well in the jug and while it did grow roots pretty well the top never really developed. It kinds grew all willy nilly, with heavy branches and not much shape. 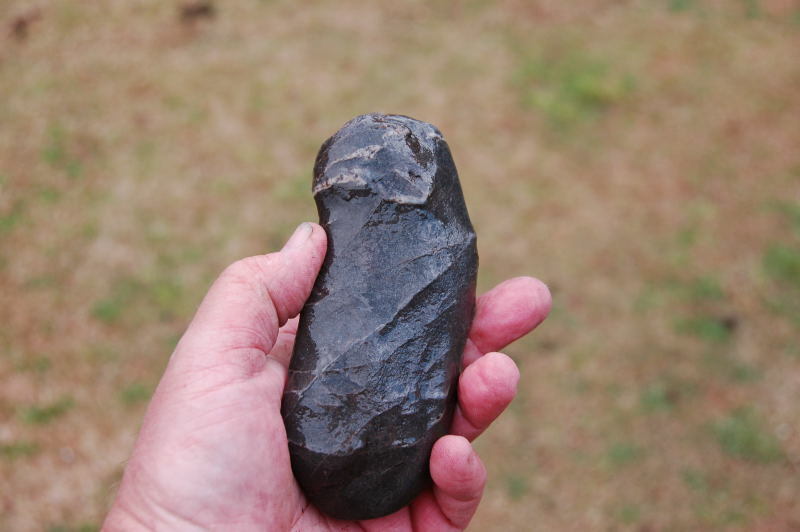 In 2012, I decided that maybe it could become a trident on a stone. 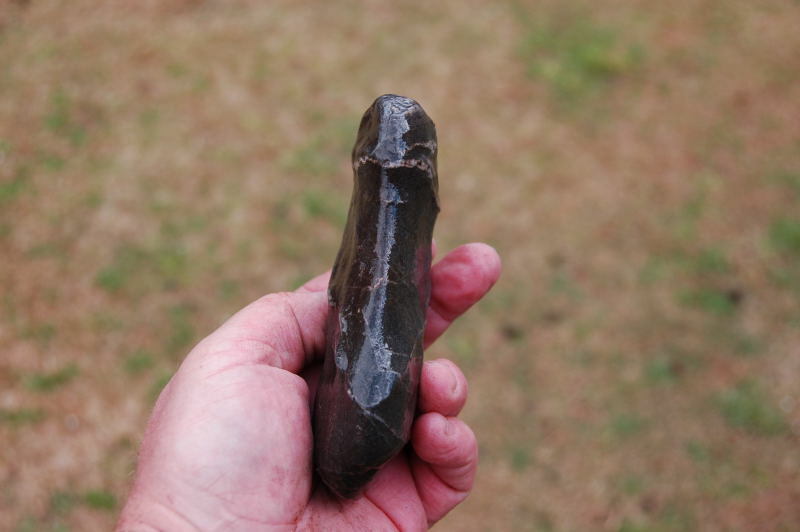 The stone had a …er..unique shape. Very masculine. I tried bubble wrap as my wrap for affixing to the stone. My thought was that the bubble would help push the roots into the shape of the stone and get good adhesion. Also the wrap would last a few years and not fall apart so fast. So here is the tree all wrapped up ready to grow and make a smashing bonsai. Well the top was pretty bad and looked like hell. no branch structure and the tree really was about the base and not so much the top. Over the next three years I would prune and snip wire here and there. Last winter in Jan. 2014, I took the wrap off and the rock fell out of the roots. WTF, something went wrong. By now I had a better canopy and I was able to start removing branches and wiring others. 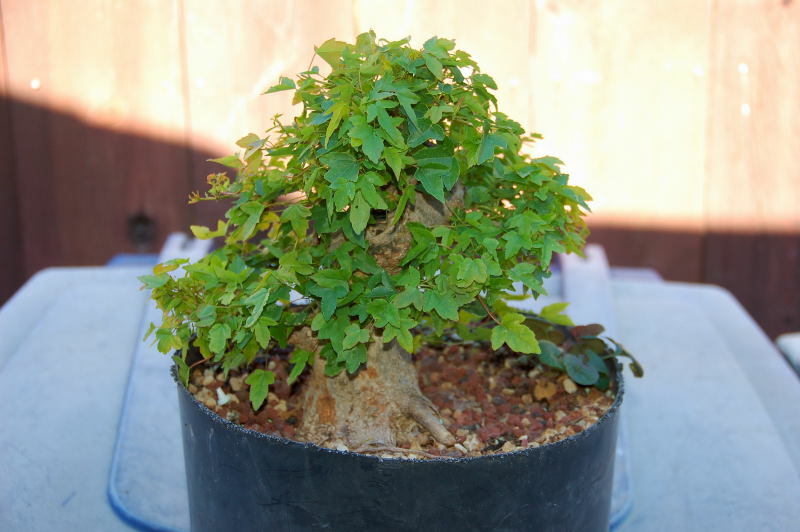 It was repotted in the Bunzan semi cascade pot. 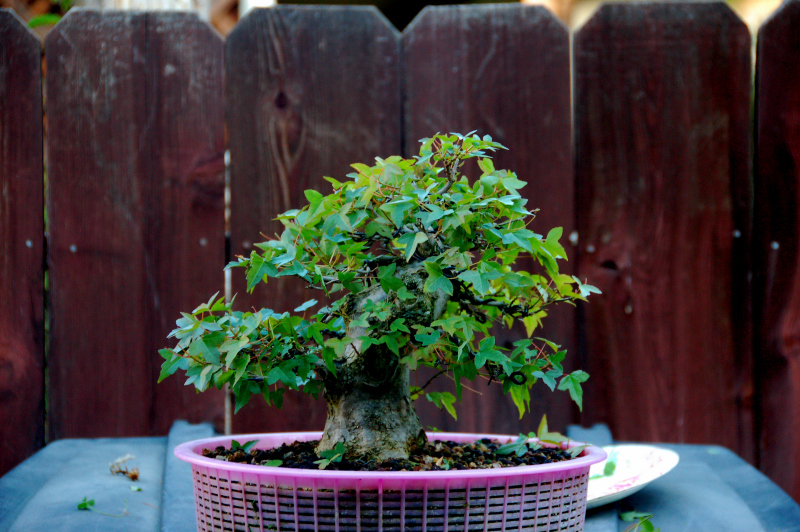 The tree recieved more attention last year due to the Keppler Snail Scourage of 2014. It was moved to the safety of the patio untill the snails died off. Tonight it gets a photo of the new look and nine years work. More work on the drop branch on the right but its getting there. Buruhon in Japanese stands for bullhorn. 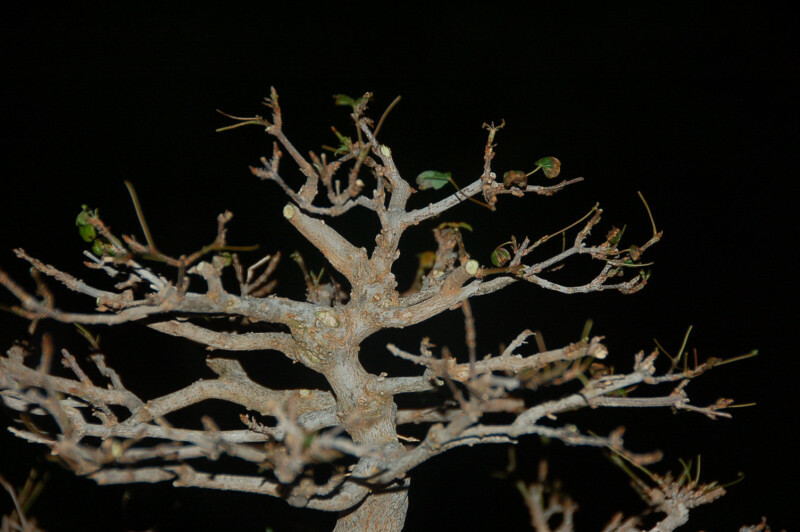 It was the name given to this specimen in the desert by Harry Hirao when he seen it. 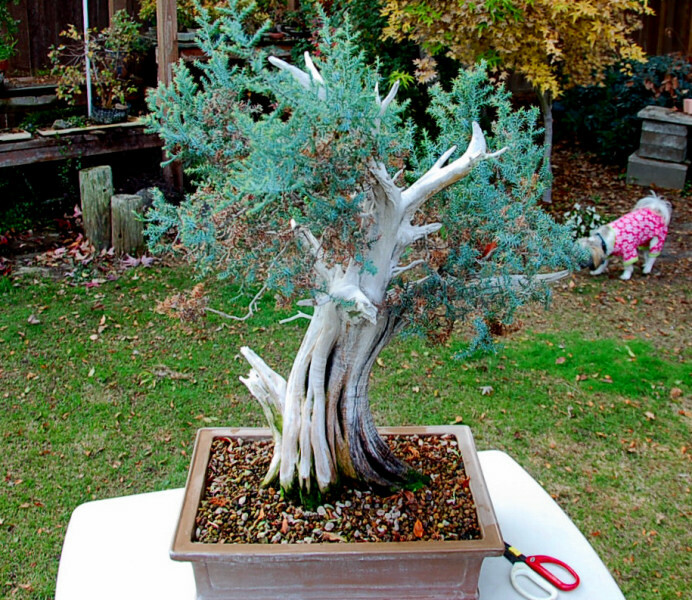 Earlier this year during the repotting season, this juniper was given life saving care. It never went to adult foliage always staying with awl type foliage and the tree never flourished and always seemed on a slow steady decline. 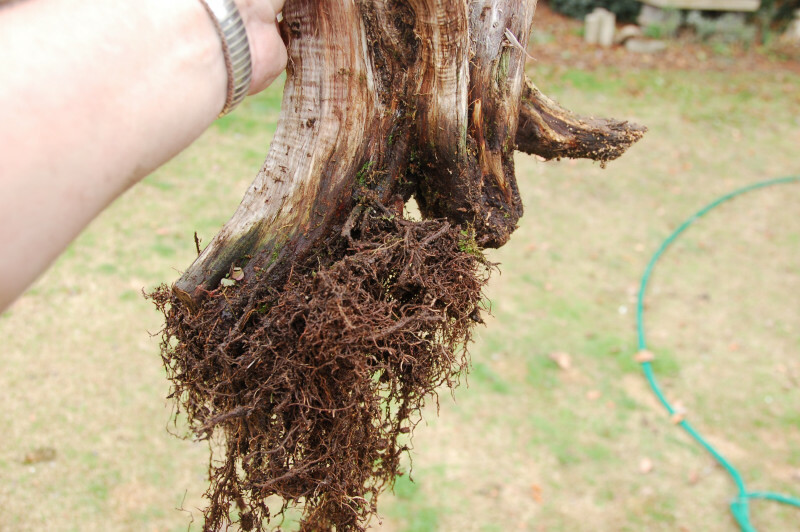 I figured the roots were probably the culprit and never really got a good foothold. 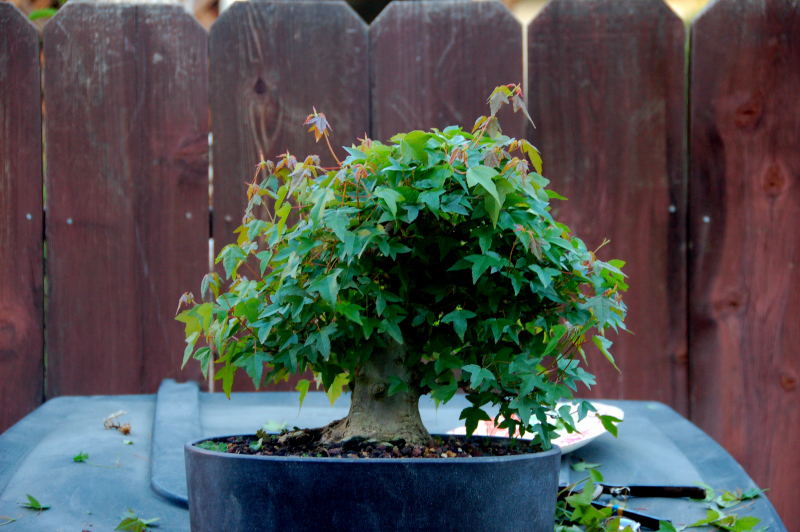 Most of this is my fault as I simply just cannot wait to start getting them to a bonsai pot. Even though I started with a larger pot and worked it down over a few years, I probably should have allowed a couple of years growth between potting down rather than just one season. Its taken me a long time, but I now realize that just because it is alive does not mean it can be handled roughly, by repotting and things. During repotting I chose a couple of plants this year to be the beneficiary of growing in 100% Grow Stones. 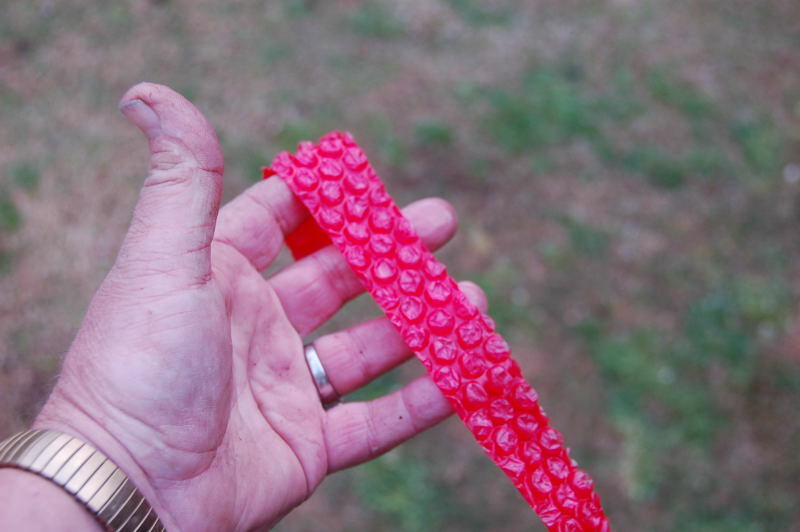 This is a completely man-made product that functions exactly like pumice but is made from recycled glass. It can be purchased in hydroponic stores that cater to the weed trade. The reason I chose this tree was due to the poor and sickly look of the tree. Using a product for the first time as a stand alone ingredient has to be used by itself to really know in the product can do what it claims. 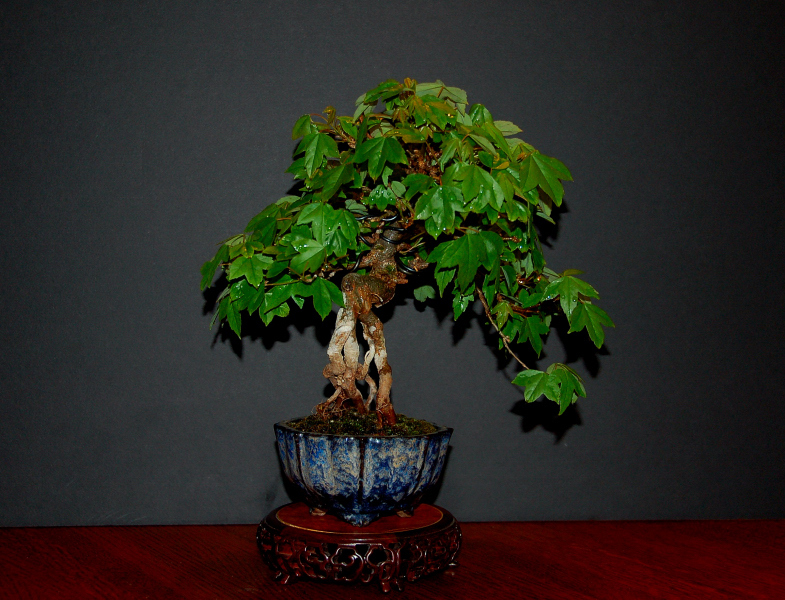 The other tree I chose was a trident maple. It too was grown in 100% Grow Stones. 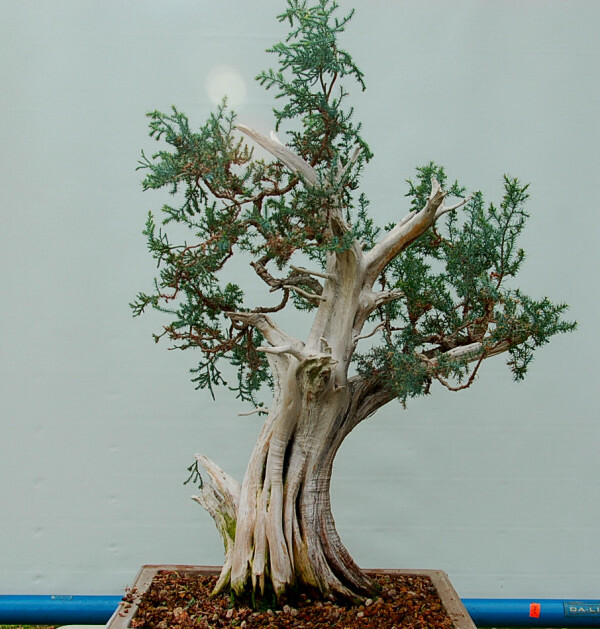 The product worked very well for the juniper from a desert climate while the tridents suffered due to the product just not retaining enough water. 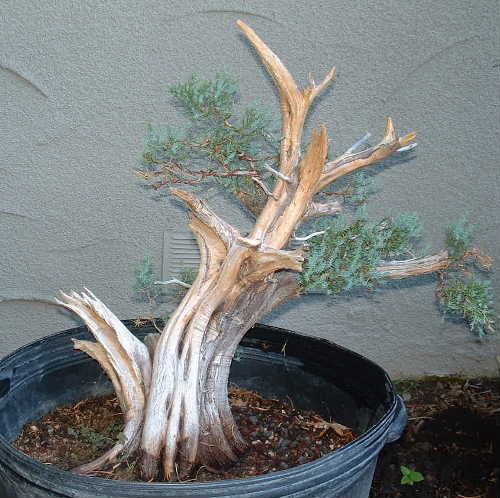 The desert juniper is quite at home with more dry feet and so the pumice allowed a good exchange of air yet had a good moisture content when watered, and then tapered off as it dried. Much like the juniper would experience in the desert with a flash flood summer rain. Eleven months later the tree has responded well to the pumice. Its foliage while still juvenile is growing very well. Most of the tips stay green now, as before they would brown off the shoot would stall. Now the shoots are elongating. I feel the roots are now in much better shape and have grown a lot since the repot. 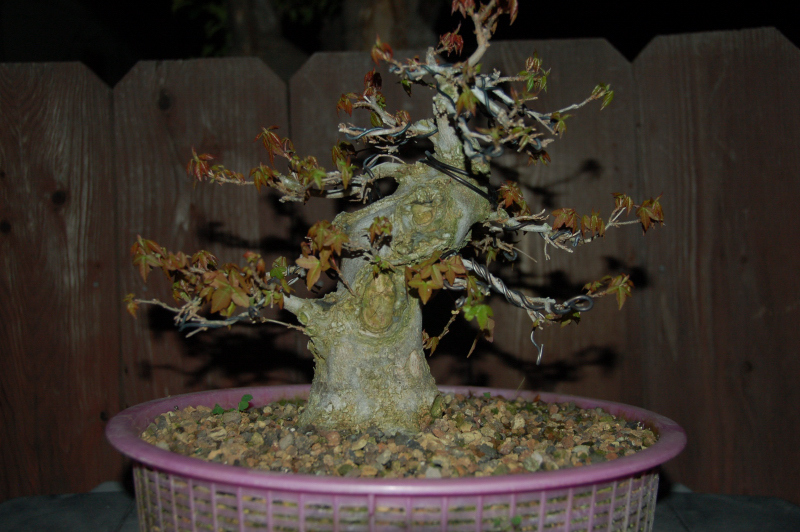 Some branches that were still wired when I repotted had now swollen and the wire was starting to bite which was a good sign since some of the wire had been on there since 2008 and had never seen and expansion of the limb. Today I cleaned out all the old brown shoots that had died even after the repot. 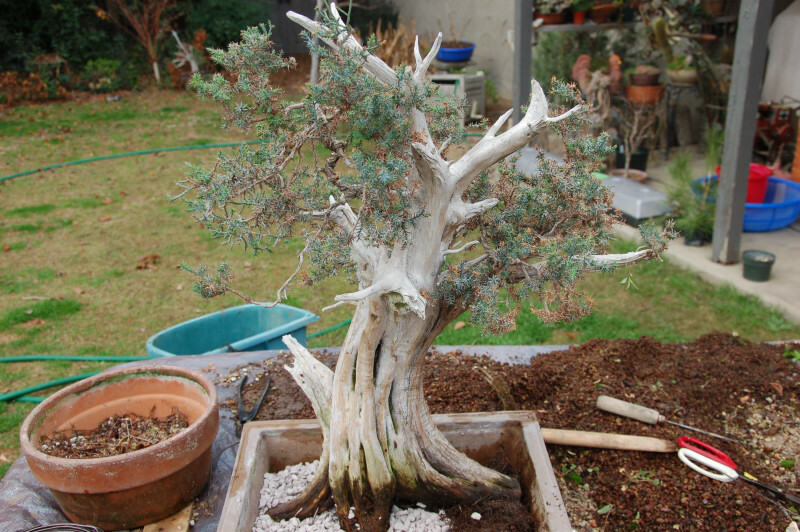 Some of the smaller branches had died and those were clean out as well. I decided that after the clean up I would wire the tree. It has not been wired since 2008 and the branches were pretty long. This tree has always suffered growing foliage and branches and not I really had something to work with. Not as much as I would have liked but now I will have a good base to expand on and the outline is much better than the tree has ever been. This is the next size down. This is in 2008 and the only time the tree has been wired. During this season repot this is the only roots I had on the tree. This is the backside of the tree. The only live side on the tree is the right side seen from the front. 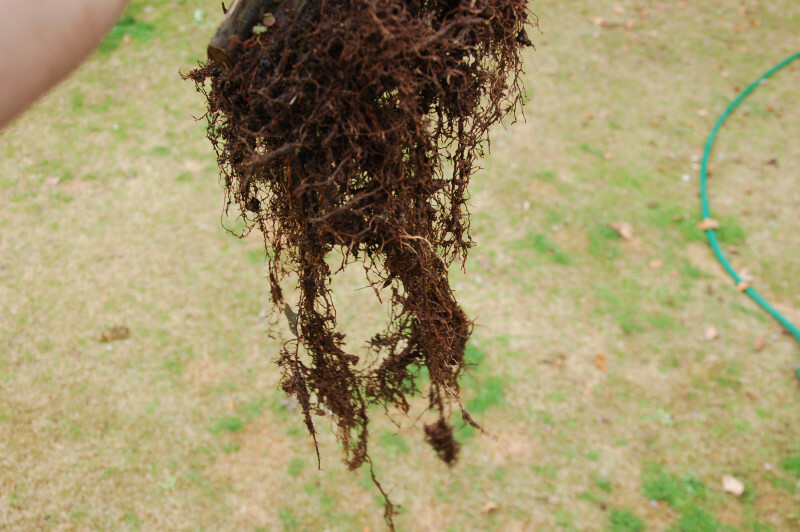 This is the roots as seen from the front. This is not a lot of roots to support this tree. If I wanted more foliage i will need a proportionate amount of roots to get them. 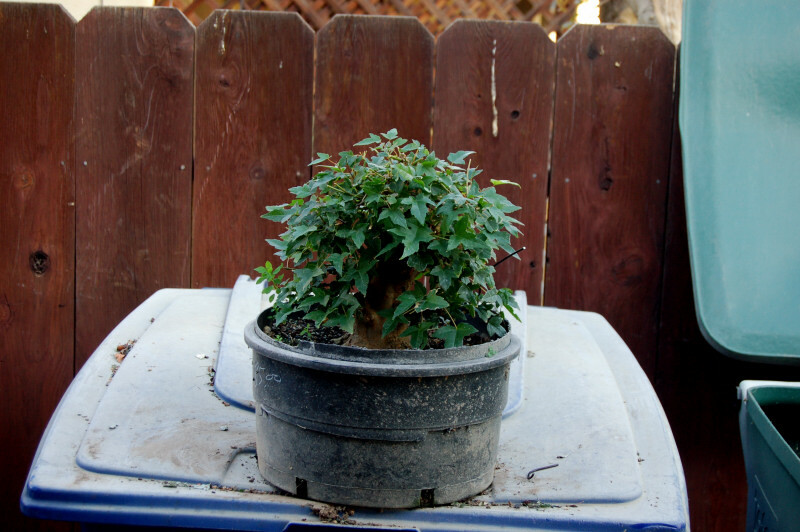 This is the tree tied into the pot. The roots are tucked into one small corner. Started to backfill the pot with 100% pumice. 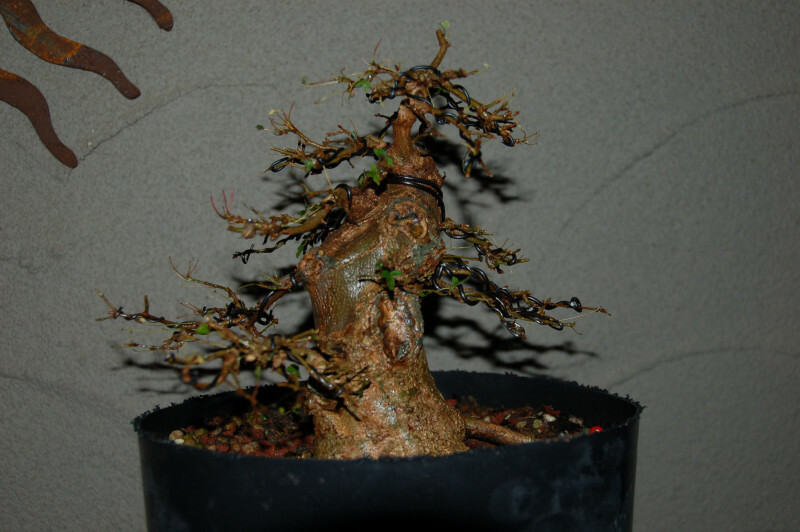 This is how the canopy looked at the time of repot. A lot of the foliage is dead and continues to die. New shoots come out and then just dry up and turn brown. The tree is tied in with a hole drilled thru the trunk and then wired into the drain holes and tied. At this point I stopped with the pumice and topped the tree off with my regular soil mix just so I didn’t have to stare at the stupid tan pumice all summer. Today I started the work on the tree by cleaning up all the dead stuff. Watch dog looking on. Too cold outside so Mommy put the sweater on the watch dog. All the dead stuff can be seen in the canopy. Notice on the top of the tree I have very strong upright-growing shoots, as well as other places on the tree. 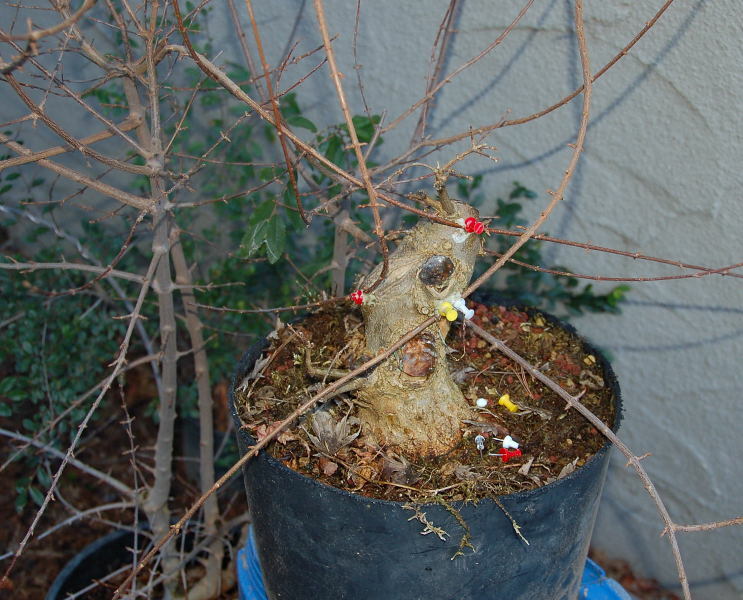 This is what the tree looked like after cleaning out all the dead twigs, and dead needles. Lots of good growing foliage now. This is as far as I could get today. I was tired and this was about 5 hours work. Still lots of detail wire to put on especially on the back of the tree. The canopy is too pointy and I want a rounder softer canopy, but will have to wait for more growth. I am pleased with the tree so far. It looks like the larger particle size as well as the greater air exchange seemed to save the life of this juniper. Maybe it will really look good next year with another year of growth. About every three years I have to come in and prune out branches that are getting too large for the canopy. 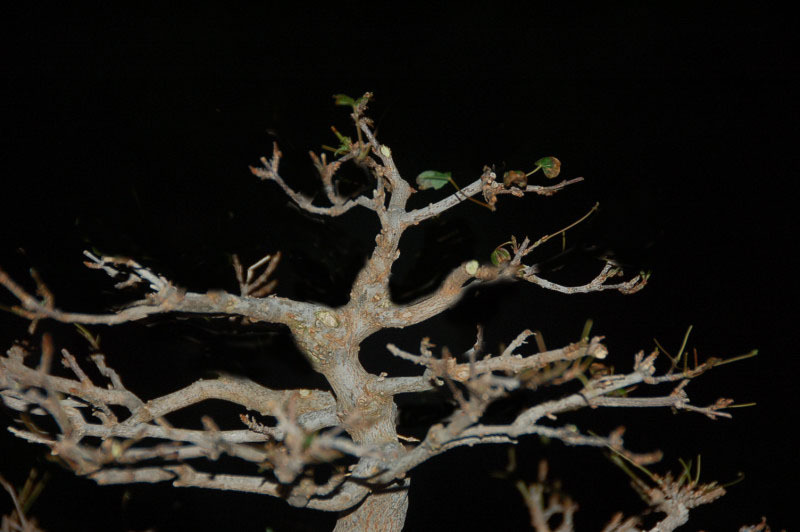 These coarse branches will sap all the energy from the smaller twigs and just continue to get larger and large with removal the only option left. 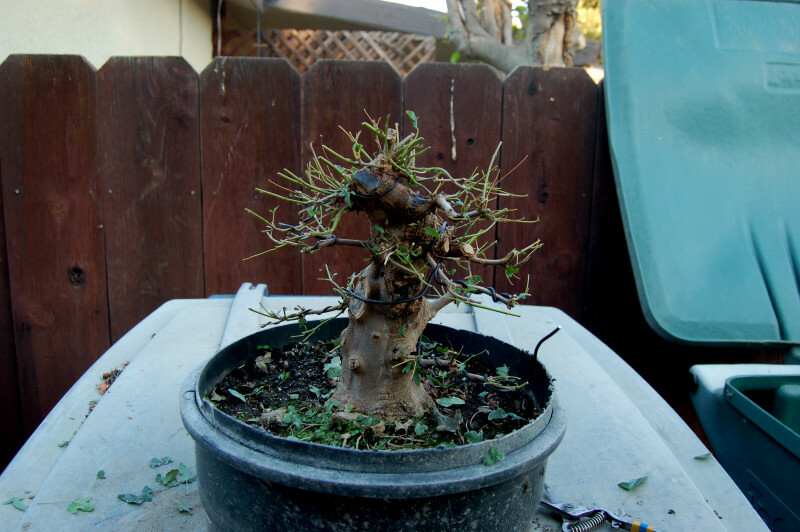 Better to take them out sooner than later since the larger pruning cuts will just take that much longer to heal. This is the way the tree looked before removing the heavier branching.